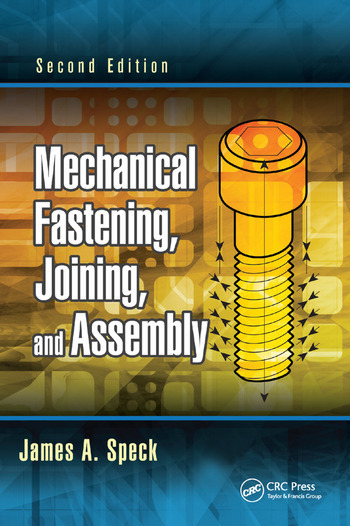 Mechanical Fastening, Joining, and Assembly, Second Edition is accessible to novices and experienced technologists and engineers, and covers the latest in fastener technology and assembly training. James A. Speck, PE, worked as a regional manager of The Johnson Gage Company, Bloomfield, Connecticut, following a career in the fastener industry. He has trained and served as a technical expert in the Department of Commerce’s National Voluntary Laboratory Accreditation program for fasteners and metals; presented numerous workshops and seminars on fastener fundamentals, fastener applications engineering, and screw thread technology; and authored numerous publications. He received his BS (1971) in business administration from Drexel University, Philadelphia, Pennsylvania, and an MS (1974) in management from the Hartford Graduate Center, Hartford, Connecticut, and he is a licensed professional engineer in Connecticut.